Retired Chief Officer Patch | New England Association of Fire Chiefs, Inc. This patch was designed (for retired Chief Fire Officer ranks) by the New England Association of Fire Chiefs, Inc. and is copyright protected. 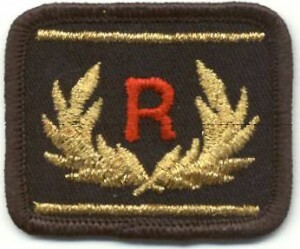 Retirement insignia is a patch to be sewn on either sleeve 1/2 inch above the top stripe and should there be no stripe, 4 inches above the cuff of the sleeve. Also adopted for national & international use by I.A.F.C. Res.2000-3.